Extreame Savings Item! Free Shipping Included! 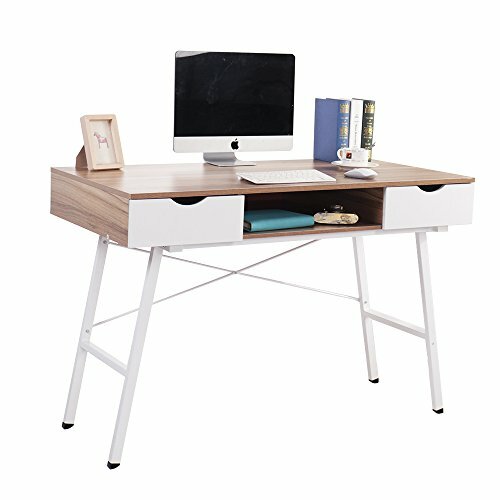 Save 47% on the Soges 47'' Computer Desk Office Desk with Drawers Workstation Desk Writing Desk Modern Desk, Oak CS-878-120OK by soges at Momiji Studios. MPN: CS-878-120OK. Hurry! Limited time offer. Offer valid only while supplies last. 47.2L * 23.6W * 29.5H inch; weights 55 lbs, load capacity 800 lbs. Particle wood with smooth wood finish and heavy-duty powder-coated metal which ensures stability. Two Drawers are used to keep daily supplies which keeps your space clean and tidy. Multi-functional: The desk can be used for working, writing, studying, gaming, dressing at home, school, in office and other occasions. Please note: If you receive a damaged or defective item, please feel free to contact us. Our after sale customer service will solve all your problems within 24 hours.